You can obtain a Loyalty Card by visiting any Turtle Jack’s location; simply ask any team member for a card. You may also request a card by logging on to our website and selecting the “Request a Card” button. One will be shipped to you within 12 days via Canada Post. What are the benefits of signing up for the loyalty program? By enrolling in our Loyalty Program, every time you dine you will earn 1 point for every $1.00 you spend (before taxes and gratuity). The minimum redemption amount that you can use for great food and beverages at any Turtle Jack’s location is 100 points which is the equivalent of $5 off. Loyalty GOLD: Accumulate 6000 points in a 12-month period (from January 1 to December 31) and you will begin earning 1.25 points for every $1.00! Loyalty PLATINUM: Accumulate 10000 points in a 12-month period (from January 1 to December 31) and you will begin earning 1.50 points for every $1.00! Members have extra chances to win on promotions, surveys and referrals and will receive exclusive offers of upcoming events! How do I contact TLC with a question or concern? How do I cash in my rewards? The minimum redemption is 100 points which is the equivalent of $5. Just let your server know if you want to apply any of your points towards payment of your check balance. You can use some or all of your points (100 point minimum) at any of our Turtle Jack locations. What is the difference between Point Balance and Point Value? A Point balance is the current total number of points accumulated in your account. Point Value is the cash value of those points. The minimum redemption amount is 100 points or $5.00. Do I need to be a specific age to receive a Loyalty card? Guests must be 16 years of age or older to receive a card. Can I earn points on alcoholic beverages? You can earn loyalty points on all purchases, including alcohol. Can I earn TLC points on my take-out and delivery orders? Unfortunately we are not able to give you points for orders placed through third party systems such as Skip the Dishes or UberEATS, however you can earn points on take-out orders placed directly with a Turtle Jack’s location. Just be sure to give us your TLC account number at the time of ordering! Can I add my own points? No, guests can not add their own points. This insures we maintain the integrity of our program. Email tlc@turtlejacks.com with any questions. Program points do not have an expiration date. However, if a member does not earn or redeem any points or conduct any account transactions in 12 consecutive months, their card can no longer be used and their point balance will be reset to zero. I forgot my card – can my points be added after the fact? Unfortunately not, we do need to see the physical card at the time of the visit in order to validate the transaction. How do Members check their account information as well as their point balance? 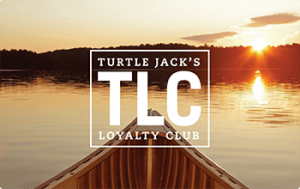 To check your TLC account balance simply click on the “Check Balance” link under TLC Loyalty Club on the Turtle Jack’s website at www.turtlejacks.com. Enter the 21 digits from the back of your TLC card. To check your account information click on the “Login to My Account” link under TLC Loyalty Club on the Turtle Jack’s website at www.turtlejacks.com. Log on to your account using the username and password you created. Members can view their account information, current point balance and current point value. Also, members will receive a Frequent Diner transaction slip each time their TLC card is used. This transaction slip will serve as confirmation that your points were credited to your account. In addition to showing the points added for that visit, you will see your total point balance and your point value. I have lost my card – what should I do? We can help. First, go to our website at turtlejacks.com. Click on TLC Loyalty Club and then click on “Login to Your Account”. Login to your account using the username and password you created. Then, go to the “Edit My Profile” link and double check that your profile includes your current mailing address. Next, fill in the “Report Lost or Stolen Card” form to report your card lost or stolen. Your old account will be automatically frozen and a new card will be sent out to you in the mail. You will then need to register your new card through the registration form provided on the turtlejacks.com site, and send us an email at tlc@turtlejacks.com with your full name, the email associated with your account and your new card # so we can transfer your points balance onto your new account. I just got my card tonight! I didn’t know about this program and I have been coming here for a long time. Can I get tonight’s bill (or any of my previous bills) added to my account? You can start using your card immediately! Unfortunately we cannot honor purchases made before receiving your TLC card. You will however, receive a coupon for $10.00 towards your next visit with a purchase of $30 or more just for registering your card on our website! Your card needs to be registered in order to redeem points towards the payment of your guest check. My friend does not have a loyalty card or want to be part of your Loyalty Program. Can I use my card to collect points when he/she pays their bill? No, your card is for your bill only and cannot be swiped with other guest’s bills. A single Loyalty card cannot be used more than 2 times per day.